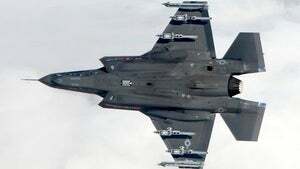 America's F-35 may not be very useful, but it's still, on paper, one hell of an aerial destruction machine. This freshly-released image from the F-35's first-ever weapons test shows the punch it'll pack. The weapons load for this mission involved carrying two air-to-air A IM-9X missiles on the outboard wing stations. In addition, the F-35 carried two internal 2,000-pound guided bombs (GBU-31) and two advanced medium range air-to-air missiles (AIM-120) inside the two internal weapon bays. No weapons were delivered during the mission. The jet also had mounted four external pylons that can carry 2000-pound air-to-ground weapons. Between those air-to-airs and the GBU-31—used for laser-targeted base busting—the F-35 packs enough for either dogfighting or ground war. And that's only part of the jet's potential: it's (supposedly) capable of flying with a full 18,000 pounds worth of explosives—some of them tucked away inside internal bays to boost stealth powers.